Help Victoria patch things up with her estranged father by launching a chain of exotic restaurants in Gourmania 3: Zoo Zoom! Find the ingredients for spicy fajitas at Tres Amigos, or prepare a mouthwatering Greek Salad at Aesop's Tables! From pouring hot java at Bean Me Up to serving ice-cold treats at Beaches and Cream, there's never a dull moment as you work quickly to please your customers and increase your profits! 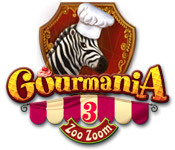 Gourmania 3: Zoo Zoom is rated 3.9 out of 5 by 24. Rated 5 out of 5 by upsysydaisy from A Fun, Pleasant Change For Me I passed over this game many times, being on the fence about TM games. However, the animals finally won me over. I absolutely love it! 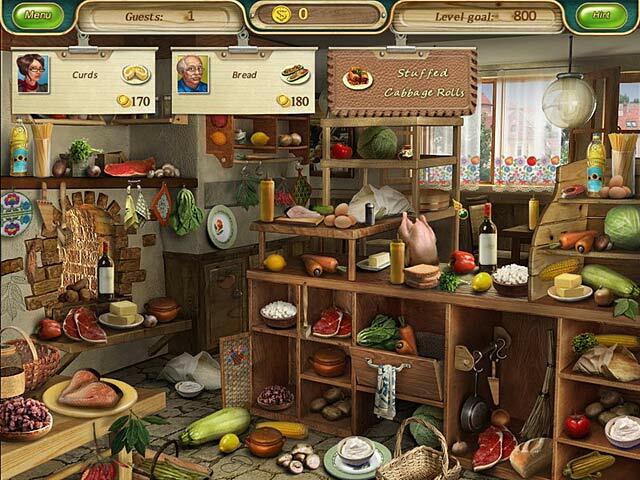 The restaurants involve such a busy time finding objects and serving the customers. It was a good challenge and lots of fun because the challenge was not so great as to become a dreaded part of the game. My favorite part was refurbishing the zoo and taking care of the animals. Earning enough money to rebuild the zoo was a slow process because very little cash was given for your accomplishments throughout the game. But it certainly was not a negative for me, it just increased my eagerness to see the results of my efforts. I loved tending to the animals but I wish there had been more tasks to perform in that regard. Eventually, the tasks became repetitious so the predictability diminished the fun somewhat. However, overall this was a very enjoyable sweet game. It was off the beaten path for me because my game collection is full of fantasy, HOGs, mystery/detective, etc. Other gamers surely have the same since BFG seldom offers anything else. That's why I am always eager to try something light without searching in the dark for items and discovering yet another locked door requiring a lost key and I can do without another demented character inflicting evil upon the world. I recommend Gourmania 3 if you need a little break from the heavy stuff ! Perfect as a coupon purchase. Rated 5 out of 5 by thathee from Barb's Review Great game, I have played all Gourmania games, this is the best one, visual, and storyline. I can't wait for the next one to come out, hope it is as good as this one, or better. Put a cat in the next one. Rated 5 out of 5 by JennyerSuper from Absolutely loved this game This game was slightly similar to the concepts in other games, like Gardenscapes, where you get to customize your own area, in this case your very own zoo. 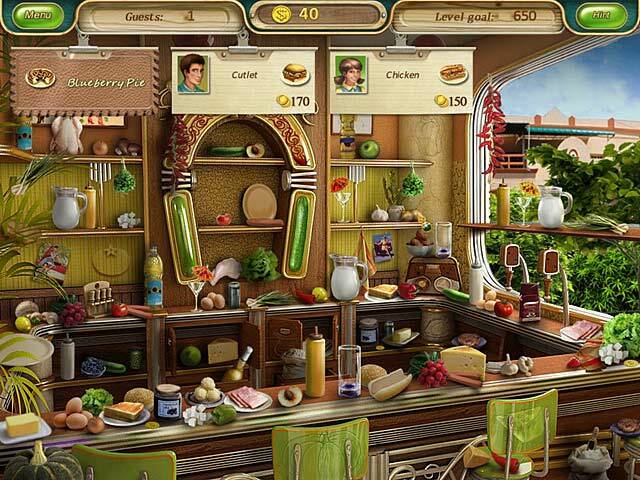 I loved playing the different restaurants to earn money to build the upgrades. After you introduced different animals you had to periodically go into their areas and feed/water/play with them, I thought this was a really fun addition to the game which added some depth. I really liked that you didn't play the same restaurant several times in a row before moving onto the next. This kept variety in the game and kept you from being able to remember the exact location of every item in each location etc. There were enough different restaurants to play that it kept it nice and challenging. I liked the storyline on this as well, you are a young socialite and you have to earn your father's respect by managing restaurants to earn money. I really enjoyed this game, definitely worth a credit/money. Rated 5 out of 5 by duckyxoxo from The best of them all!! All of the gourmanias are a lot of fun. They are enjoyable as a mix between time management and hidden object, this one is an improvement on the previous version and if you liked the previous ones this one was the best by far!! Rated 5 out of 5 by godfreygirl from I love this game....Lots of fun & VERY addictive!!! I didn't care for the first Goumania games but this one I love. You gradually build a zoo.....you fix the pens, feed them and interact with them. But the addictive part is playing the restaurant HO parts. I love it that they go back to the same restaurants and you can see if you can remember where things were to build your cash. Also you get to build new and different restaurants through the game....it's LOADS of fun and, as I said before, it's very addictive. You keep wanting go make more money to buy more things for your zoo and buy more animals, pens, booths, etc. It's a great game and I highly recommend it. Rated 5 out of 5 by cowclaudia from I love it This is becoming one of my favorites of all 40 games I own from BF - you have three tasks - create restaurants, build a zoo and small mini games. Graphics and music area great and since there is no timer (which I usually hate) it is very relaxing and a lot of fun. I highly recommend it. Rated 5 out of 5 by MamaBahama from Great Combo Game I actually purchased this game many months ago and somehow forgot to play it. I found it last night and omg, I love it. I love the way they've taken a HO game and incorporated it with a TM game. I usually do not like TM games because I'm not good with that type of game as I can never seem to move fast enough. However, in relaxed mode, this one does not make me feel pressured like so many others and that is a definite "plus" in my book. I highly recommend it. It's a lot of fun and I don't think you'll be disappointed. Rated 5 out of 5 by goaliemom3490 from Only play the free hour game and I loved it. I will be buying the full game. Can't wait to make enough money to finish my zoo. Rated 5 out of 5 by TheOldWife from Good things come in threes The third in the series is as enjoyable as the first two. This is a good combination of time management and hidden objects. 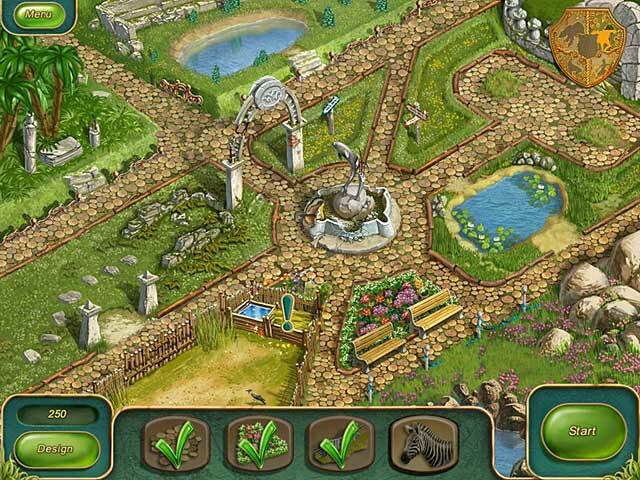 This time you get to design a zoo as you manage a selection of restaurants with different cuisines. Rated 5 out of 5 by nume9fat from GOURMANIA FUN I enjoyed playing this game a lot. Would like more like it.